I’ve tried running away from God. I’ve been angry with Him. I’ve questioned and doubted His plans. I’ve been frustrated with Him. I’ve wanted nothing to do with Him. And yet, in the midst of all of those times, I learned something valuable about God and who He is: God loves me too much to leave me alone. He stays. He remains. He’s faithful, even when I’m not, and He waits until I’m ready to turn back to Him so that we can start over again. He cares about us too much to leave us hurting and bitter and broken and empty. He loves us too much to let us go through it – whatever “it” is, big or small – by ourselves. He loves us too much to give us what we want at the expense of what we need. He loves us enough to say “No” sometimes. It doesn’t mean He’s not good. It doesn’t mean He doesn’t care. It doesn’t mean He’s not able. It means there’s another way. A better way. His way. I don’t always get it – at least not in the moment. In fact I usually don’t. But I’m not asked to “get it” – I’m asked to trust Him. He loves us as we are, wherever we are in life. But He also doesn’t want us to stay there. 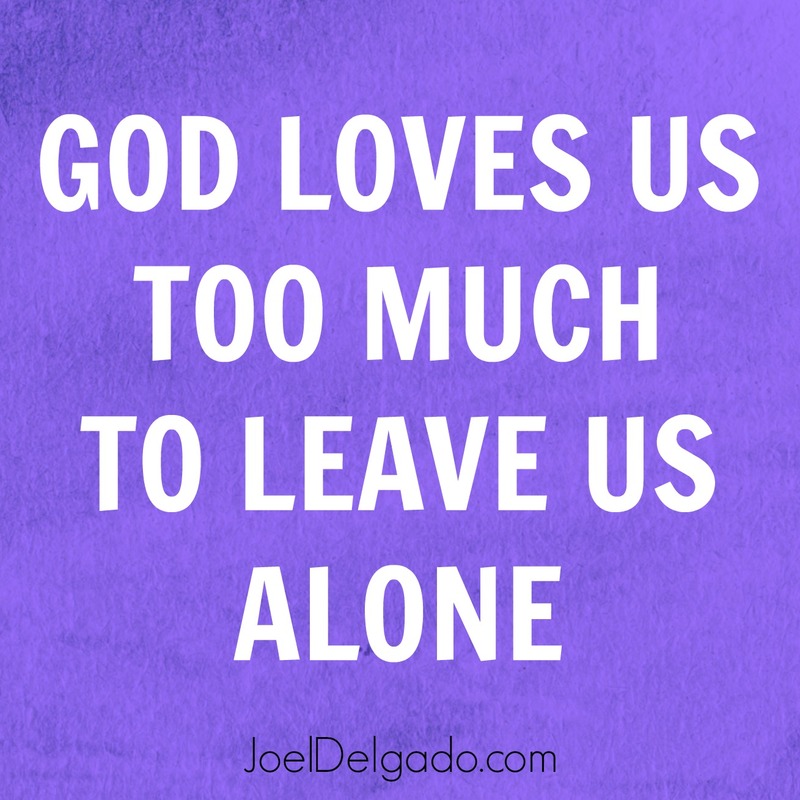 And that means in the same way that God doesn't leave us alone, we shouldn’t leave God alone, either. And just like God is continually pursuing us, we should never stop pursuing Him. 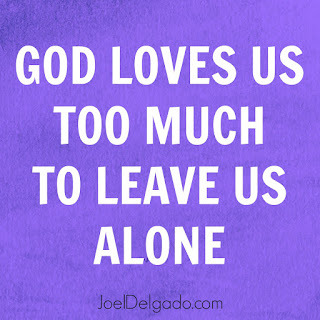 God doesn't leave us alone, so why should we leave Him alone? We have an open invitation to come to Him with everything – from our praise to our pain; from our questions to our requests; from our doubts to our thanks! If you're a Christ follower, you serve a God who is deeply personal, intimate and approachable – not some detached deity. Got questions? God wants to hear them. Feeling angry? God wants to hear it. Need guidance? Ask God for it. And don’t stop asking until you get answers! Be the kid in class that doesn't stop asking questions. God can handle it. He wants to handle it. Life is better when our stuff is out of our hands and in His. I’m glad that God, despite my own emotions and failings and doubts, still won’t leave me alone. He is still there. He still cares for me. He still loves me. He still wants my heart and my trust. He still wants me. And those truths keep me running back to Jesus, asking Him to soften my heart a little more each day. To help me have a little more faith today than I did yesterday. To help me just keep my eyes fixed on Him and not on anything else. God won’t leave us alone. And we shouldn't leave Him alone, either. Joel, thank you, this is a very timely word. Much awaited prose from a spiritual wordsmith could never disappoint. Be fed, encouraged and strengthened in all that you endeavor for the glorification of Our Lord and Savior, Jesus Christ. O what a nice lines you share here on your blog post. I am really impressed with these. Gona share it right now.My younger brother told me about some custom essays writing last night. I hope it will be useful. Nice day!